It has been a big year at the Aquarium of the Pacific. In addition to developing new exhibits and programs and successful industry-leading breeding efforts with several species, the Aquarium has participated in important conservation work, led the dialogue on major issues in the scientific community, and shared plans for a new expansion that will inspire the public to create a better future for our planet. Here is a look back at the top happenings at the Aquarium in 2016. 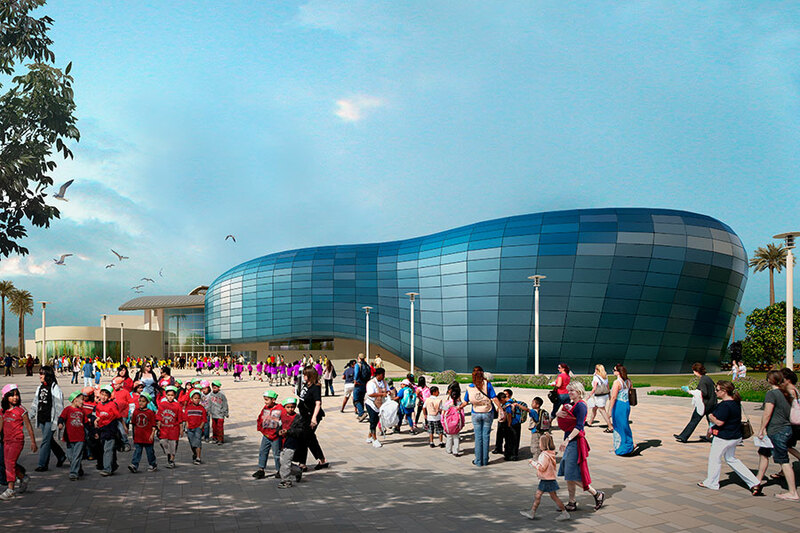 In March the Aquarium publicly announced the Pacific Visions expansion project and unveiled the design plans. The Pacific Visions wing, slated to open in late 2018, will help Aquarium visitors better understand the challenges our ocean faces and the opportunities it holds and imagine what the future of our planet could look like. This expansion will include a state-of-the-art interactive theater, a larger changing exhibit gallery, and an art gallery. Visit pacificvisions.org to learn more. 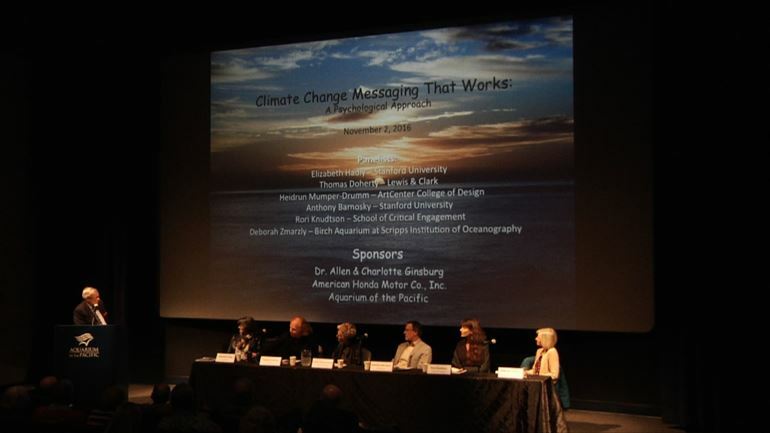 On November 2 the Aquarium hosted a day-long forum bringing together climate scientists, psychologists, and experts from other fields to develop strategies to motivate people to act on climate change. The ideas developed during the Aquarium forum will be captured in a set of programs that will be tested and evaluated at the Aquarium with its visitors over a twelve-month period. Vanishing Animals was inspired by a paper published in the journal Science in January 2015 that detailed the possibility of mass extinction in the ocean. The Vanishing Animals exhibit translates the concepts detailed in the paper into a gallery of live animal exhibits, multimedia stations, exhibit panels, and videos for the public to learn more about this important moment in time. The film of the same name is narrated by actor Anthony LaPaglia and plays daily at no cost in the Ocean Theater. Opened in May, the Horses and Dragons exhibits feature more than a dozen species of seahorses, seadragons, and their relatives, including babies. Two of the features species–longsnout seahorse (also known as the slender seahorse) and dwarf seahorse—have never before been exhibited at the Aquarium. Visitors learn how these animals are bred and cared for at the Aquarium and learn about the conservation issues these animals face in the wild, including harmful fishing practices, the traditional medicine and curio trade, and habitat loss. The popular moon jelly touch lab and a new exhibit featuring mudskippers opened on the Aquarium’s Harbor Terrace in September. The new outdoor moon jelly pool features a large curved tank that can accommodate the many visitors who wish to touch these gelatinous creatures. Mudskippers are unique fish that have adapted to an amphibious lifestyle and can live both underwater and on land. Harbor Terrace can be accessed through the Aquarium’s Pacific Collections gift store or by following the walkway past Lorikeet Forest. The Aquarium developed two musical collaborations to allow musicians to interpret ocean life and translate the movements of marine animals into sound. In February Ocean’s Orchestra was performed live at the Aquarium by young music students in collaboration with music education team WE ARE LIKE MUSIC. The twenty student musicians played stringed instruments and improvised and interpretation of the movements of the animal inhabitants of the Honda Blue Cavern exhibit. In June the Long Beach Chorale premiered Chorale of the Jellies at the Aquarium, a piece originally commissioned by the Aquarium in 2015 as a symphonic work. This project brought art and science together to translate the movement of sea jellies into a symphony. The music was developed based on an algorithm that tracks the movements of sea jellies and translates them into sounds. The original Symphony of Jellies is available for purchase on iTunes. ©Michael Couffer/Grey Owl Pictures, INC. The Aquarium had success with several breeding efforts in 2016. In May the Aquarium welcomed its fourth generation of Magellanic Penguin chicks hatched at the facility. The two male penguins made their public debut in August and were named Fisher and Astaire. Also in May aquarists captured a male ribbon dragon giving birth on video, resulting in nearly 200 babies. To our knowledge, the Aquarium of the Pacific is the third aquarium in the world to successfully breed this species. The Aquarium’s breeding pair of Guam Kingfishers, which are extinct in the wild, began to show signs of compatibility by laying two clutches of eggs. While none of the eggs successfully hatched a chick, the Aquarium’s staff members are encouraged by this reproductive activity and are hopeful that future efforts will be successful. Finally, the Aquarium became the first public aquarium to successfully breed and raise giant sea bass when eggs hatched in October and a single juvenile survived past the Aquarium’s previous record of forty-three days. The juvenile is currently behind the scenes. The Aquarium’s work to reproduce this species is particularly important because giant sea bass are listed as Critically Endangered on the International Union for Conservation of Nature’s Red List. The Aquarium offered several programs in 2016 to raise public awareness about the vaquita and the pressures on this endangered marine mammal. With fewer than 100 individuals remaining in the Gulf of California, the vaquita is the most endangered marine mammal in the world and has the potential to represent a story of tragedy or of a hopeful future. The Aquarium of the Pacific is working with other zoos and aquariums to spread the message and help protect this animal from extinction through an Association of Zoos and Aquariums program called SAFE, Saving Animals From Extinction. Seafood for the Future (SFF), the Aquarium’s sustainable seafood program, hosted a panel of experts at the Aquarium as part of its Guest Speaker Series and helping to create a PSA (available in both English and Spanish) about the vaquita. SFF also launched a new series called Storied Seafood with a photography exhibit and website that tell the story of Mexican fishermen and their efforts to save the vaquita in the northern Gulf of California. The Aquarium celebrated Save the Vaquita Day on July 9 with activities and education booths to build public awareness of the vaquita and the threats that have brought it to the brink of extinction. In September the Aquarium held a live webcast to announce the release of a new report on offshore aquaculture, or fish farming, in Southern California. The report, issued by the Aquarium, the National Oceanic and Atmospheric Administration (NOAA), and California Sea Grant, was the result of two workshops convened in 2015 and 2016 sponsored by NOAA Sea Grant. The key findings from these workshops provide recommendations for growth and expansion of marine aquaculture in the U.S. and address the complex permitting system and the need for continued research and public outreach. The workshops brought together regulators and scientists to discuss the application of the best available science and incorporating appropriate tools that can inform decision making for the permitting of marine aquaculture in California. The participants represented a cross-section of scientists, regulators, and industry practitioners with proven expertise in the field of aquaculture and environmental science. State and federal agencies with regulatory responsibilities for permitting aquaculture also participated. The full report is available at www.aquariumofpacific.org/aquaculturereport. 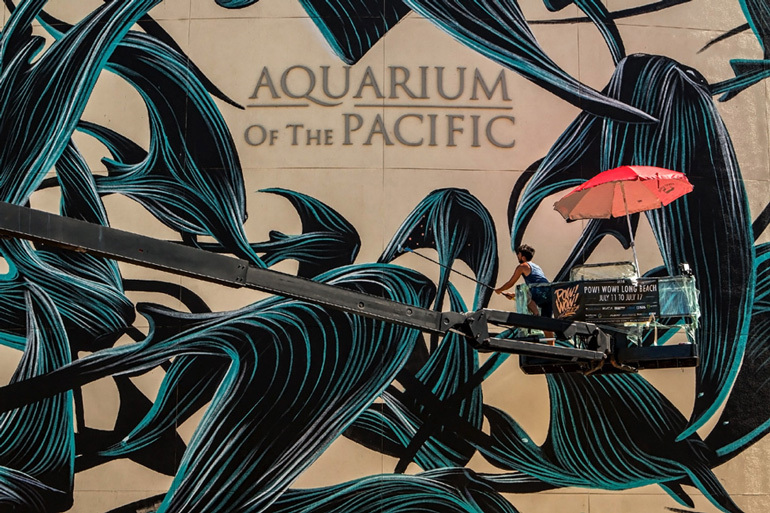 The Aquarium’s nearly 2,600-square-foot front wall was painted in July by Portuguese street artist Pantonio (Antonio Correia) as part of the second annual POW! WOW! Long Beach festival. The mural will be on view at the Aquarium until demolition begins for the construction of the Aquarium’s Pacific Visions wing. Pantonio, who hails from Lisbon, Portugal, is a street artist whose work is characterized by dark blue and black imagery reminiscent of the ocean and organic life forms. His dramatic, transformative mural at the Aquarium depicts manta rays emerging from a net. In February the Aquarium’s husbandry volunteer and blogger Hugh Ryono taught California sea lion Milo how to take a selfie. Milo’s selfie stick was made out of a target pole used in working with sea lions fitted with a GoPro camera. Milo used his selfie stick to take viewers on an underwater tour of his habitat. When the video hit Facebook, it went viral and made headlines all around the world. The original YouTube video now has more than 58,000 views, and the Facebook post reached nearly 257,000 people. 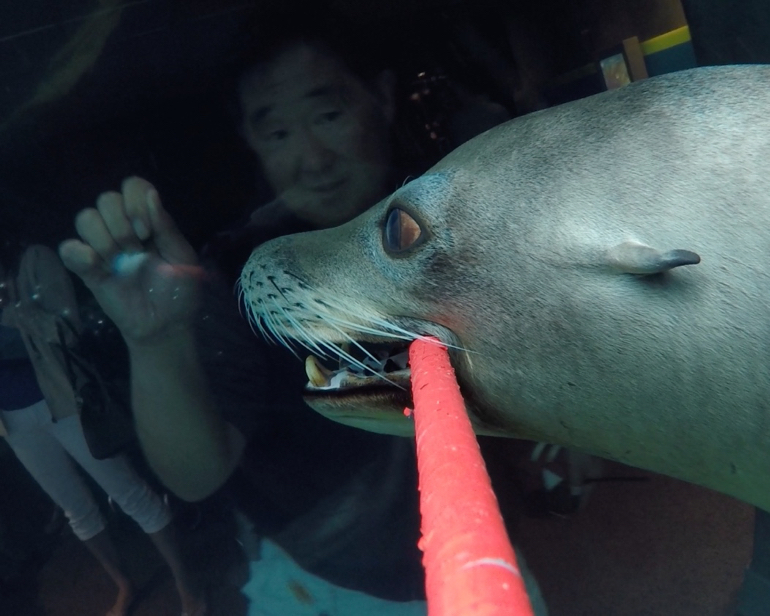 With the popularity of Milo and his selfie videos, Hugh continued to work with the sea lions and their selfie stick throughout 2016 and ended up creating three more. Visit Hugh’s blog to see them all.